We recommend, that you administrate big address databases in your own environment with an appropriate software. Nevertheless, SMSBLASTER.COM web edition provides a simple address book for administration of smaller or private address databases. Click the pen icon of the group you want to edit. Select the recipients you want to remove from the group. In case you want to remove recipients from other groups, repeat steps 4. and 5. Important remark: The recipients of a deleted group remain in the address book. 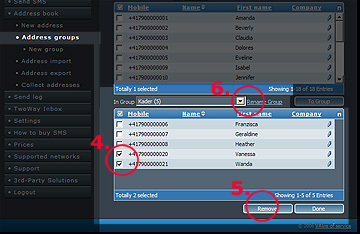 Log-in to the SMSBLASTER.COM web edition and try the described group functions right now! 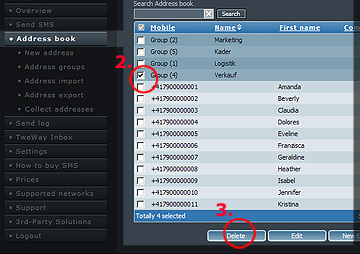 In the next newsletter you will learn more about the address book. We'd appreciate to meet our ASPSMS clients in person at our booth. VADIAN.NET presents at the Orbit/iEX online advertising with special focus on the AdSpot (TV-Commercials in the internet).